I am once again doing National Novel Writing Month this year and attempting to write the third novel in my trilogy. I may have been a smidge ambitious this time since I only just finished the second one and am, in all honesty, a bit burned out. However I'm soldiering on to get the first draft done. In the 25 days of NaNo I've written a bit over 54,000 words towards what I expect to be between 100 - 120,000 when its done. So I'm about halfway there. It's been taking a lot of my attention though and as with last November the blog is suffering a bit. As usual with my novel writing I've been posting little word count & blurbs on Facebook as I write so I'd like to share them here for anyone who might be interested. There is far more going on in the small town of Ashwood than anyone realizes, and Allie Mccarthy, like the town itself, is caught between mortal earth and Fairy, with treachery on both sides. Allie is struggling to pick up the pieces as the police investigation into a series of ritual killings contniues to wreak havoc in her life. She has lost one friend to a serial killer and seen another shot trying to protect her as the people behind the rituals work to get her out of the way. Meanwhile her own empathic gift - which may be the key to stopping the killings - is controlling her more than she controls it. In seeking training for her gift Allie may be forced to accept that defining good and evil isn't as simple as she wants it to be. Facing betrayal at the deepest level and with her own life hanging in the balance, this time Allie has to be sure that the conspiracies are rooted out and stopped, once and for all. No matter what the cost. 8,659 words - book 3 begins, picking up the pieces where the last book left off. My protagonist is still facing more than one challenge but she's realizing that the only person who ultimately may be able to save her is herself. 11,295 words - my protagonist is trying to convince the human and elven police to work together, because she's sure that's the only way to figure out what's really going on. Will the joint task force be re-formed? Meanwhile there's still a conspiracy afoot, a killer who has gone entirely off the rails, and trouble from the past that my protagonist definitely won't see coming. 17, 476 words - nothing complicates a love triangle like a marriage proposal from one person and the other taking a bullet for the one he loves. My protagonist's love life is starting to look like Celtic knot work, despite her best efforts to untangle it (and no this isn't that kind of story exactly, that's just how messy life can be sometimes). Meanwhile we have part of a plot uncovered - and gremlins, oh my! - and an antagonist who may be willing to do anything to protect someone she cares about, even if that means hurting the person herself. 24,041 words - the killer has slipped his leash and is killing now for fun as much as for a purpose, making him far more dangerous. The bodies are piling up, but can the re-formed joint task force recognize the clues when they find them? 51,388 words - everyone has their limits. Some people hit those limits and break against them. Some people hit them and get angry enough to start fighting back. My protagonist is done with running and letting other people get hurt for her. She's ready to start fighting back now. I'm a bit busy but I don't want to not blog at all, so here's a tidbit of translation, Irish courtesy of Hennessey's The Ancient Irish Goddess of War, translation my own. My third attempt at translating a normally untranslated portion of the Cath Maige Tuired: this excerpt occurs during the battle itself when the Morrigan appears to incite the Tuatha De Danann to win the battle. The Irish text is from Gray's 1983 version from the Irish Texts Society. The English translation is my own, with the usual caveat that I am not fluent but am offering my best understanding of the material. Usually it ends after "Kings, arise to battle...."
Tánic in Morrigan ingen Ernmusa anduidhe ocus boi oc nertad Túath nDéa co fertois an cath co dúr ocus co dicrai. Conid ann rocachain in laíd-se sis: "Afraigid rig don cath! Rucat gruaide aisnethir rossa ronat feola, fennát enech, ethát catha -rruba* segatar ratha radatar fleda fechatar catha, canát natha, noat druith denait cuaird cuimnit. Arca alat side sennat deda tennat braigit blathnuight tufer cluinethar eghme ailit cuaird cathit lochtai lúet ethair snaat arma scothait sronai. Atci cach rogenair ruadcath dergbandach dremand fiachlergai foeburlai. Fri uab rusmeb renanrmársrotaib sinne fri fur foab líni Fomóire i margnaich incanaigh copraich aigid dergbandaib dam aimcritaighid connaechta sameth donncuridh ibur ferurib fristongarar." 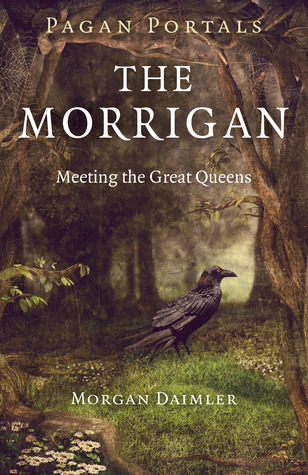 Next the Morrigan daughter of Ernmas came, and urged the Tuatha Dé Danann** to give battle stubbornly and savagely. So that in that place she chanted her poem: "Arise, kings to battle here! Seizing honor, speaking battle-spells, destroying flesh, flaying, snaring, seizing battle ---*, seeking out forts, giving out a death feast, fighting battles, singing poems, proclaiming druids collect tribute around in memory. Bodies wounded in a rushing assault, pursuing, exhausting, breaking, prisoners taken, destruction blooms, hearing screams, fostering armies battle, occupants moving, a boat sails, arsenal cuts off noses. I see the birth of every bloody battle, red-wombed, fierce, obligatory-battlefield, enraged. Against the point of a sword, reddened shame, without-great-battlements, preparing towards them, proclaiming a line of battle Fomorians in the chanted margins, helpfully impels a reddened vigorous champion, shaking hound-killing warriors together, bloody beating, ancient warband towards their doom." 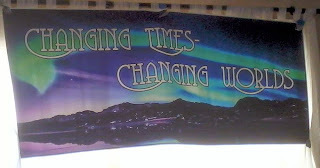 ** Túath nDéa literally "People of the Gods" or "People of the Goddess"
Last weekend I attended the Changing Times, Changing Worlds conference, an annual regional conference on metaphysics in the northeast United States. I've done workshops at the conference 4 out of the 5 years its run and I really enjoy attending. This year was no exception, with many good workshops and panels as well as excellent conversations with both attendees and other presenters. One of the most interesting panels I saw was "When is it okay to tell someone they are wrong?". The five panelists discussed various scenarios within the pagan community where someone was either publicly lying or falsely claiming things, such as experience or titles, and how they might each deal with the situation. I was surprised by the number of responses that advocated kind private interventions and mentoring to handle people making such claims. There was also a strong emphasis on accepting that wrong didn't include different, and that we as a community needed to be more open and accepting of varieties within traditions and practices. In other words there is no one correct Wicca, no one true witchcraft, no exact Reconstruction, so it is foolish to have so-called witch wars over differences in approach and method. I found that while I didn't agree entirely with everything that was said I did walk away with a lot to consider. One of the nuances that I think is consistently missed in the wider community is the difference between tolerance and acceptance. Tolerance is simply being able to allow or endure the existence of something, including things we don't like and things we disagree with. I can tolerate a lot within the community because I do not expect everyone to practice, believe, and act the way I do. Acceptance on the other hand is agreeing that something is good or suitable. There are many, many things in the pagan community that I do not particularly accept. I do not accept them as either good or suitable beliefs or practices and given a chance I'll usually expound on why. However - and herein lies the crux - I can tolerate what I do not accept. More importantly I should and must tolerate what I don't accept because it is pure ego to think that every single pagan - or even every Irish recon - would or should think and do exactly as I think and do. And I fully expect others to tolerate my practices and beliefs which they do not accept. So then, if I am tolerating that which I don't accept when is it okay to tell someone they are wrong? Well, my short answer is usually always, at least in the sense that I think we should all be open to questioning and criticism of what we do. I don't see anything wrong with telling someone I disagree with them, nor I do think that voicing disagreement must always be condemnation or attack. It is entirely possible to say "I don't agree with doing that" in a civil manner. I do also think that as a wider community we do need to be willing to speak up about the things that matter, the big things like abuse and fraud, without feeling constrained by a false propriety. This idea that we don't want to rock the boat or be confrontational seems to be so misapplied to me, when we can have huge intergroup issues over someone blowing candles out instead of snuffing them but no one wants to accuse another person of an actual serious crime when they should. That kind of behavior we should never tolerate, and yet we do while simultaneously refusing to accept minor theological differences between traditions that shouldn't even be a concern. I mean why should I care that a group I don't belong to does something I find silly or pointless, or even offensive? Whereas I should obviously care if another group is hurting children or stealing money from people. When should we tell other people they are wrong? When they are publicly putting something out that opens up a discussion; when they are making statements of fact; when they are speaking as any kind of authority - then I think we should speak if what is being said is objectively wrong. When it is a question of personal belief and ideas, then it is less telling someone they are wrong and more about engaging in conversations and dialogue and expressing an alternate viewpoint. I'm sure there are many valid reasons for silence as well, especially when its wiser or more strategic not to speak, but I think there is too much of that in many areas. We argue over inconsequential things, but we stay silent over what really matters. Probably the single most consistent debate you can count on seeing in the Celtic Pagan community is about the dating of the four Fire Festivals. Like all such debates each side tends to hold its own view quite passionately. There are three main arguments: the dates of the celebrations were set astronomically; the dates were set using a calendar; the dates were based on agricultural signs. Each side has merit, but the truth is there is not enough solid evidence to ever know with certainty how the ancients timed their celebrations. The astrology argument is based on setting the dates exactly midway between the solstices and equinoxes. This usually puts them roughly six weeks after the previous holiday and six weeks before the next one. In some cases people suggest using a specific marker such as a constellation being at a certain point in the sky or a sign of the zodiac at a certain degree. The ancient stone circles and mounds which are aligned with certain times are also used, so that when the light of the sun hits a certain point or illuminates the interior of the mound it would indicate that the holiday should be celebrated. This argument naturally hinges on two premises: that the ancients celebrated the solar holidays as well, and that they were aware of the alignments of the ancient neolithic monuments. There is also a related argument that uses lunar dating, based from what I have seen on the second full moon after the solar event*. The calendar argument dates the celebration on the first day of the respective months they occur on: February, May, August, and November. We have references in the mythology dating back to the 11th century of Lughnasa, Bealtaine, and Samhain being on the 'kalends' (first day) of those months and we know historically they were celebrated on those days in folk practice. This is somewhat complicated by the fact that the calendar system switched from the Julian to the Gregorian and when that occurred the dates shifted. When the calendar shift occurred in the UK in 1752 it moved everything back 11 days, meaning what was the first of November is now the 12th. Even a hundred years ago in several areas people were still celebrating Imbolc and Lughnasa in particular on the 12th of February and August respectively because they were using the old dating. What this means in practice is that when we see older references to the days being celebrated on the first we need to understand that they are equivalent for us today to the 12th of that same month. A Celtic Reconstructionist who wanted to use the calendar dates could, I think, choose to either go by the first of the month still or use the older dating and celebrate on the 12th. The final method of dating the celebration of the holiday is based on observation of agricultural markers and the idea that each holiday is agrarian at heart and depends on certain conditions being met. Imbolc is a celebration of the return of fresh milk and would be celebrated when the lambs were born or the sheep came into milk. Bealtaine is the beginning of summer, a time when the herds are moved to summer pastures, and would have been celebrated when the people were confident winter had passed; this is often said to be marked by the blooming of the Hawthorn and indeed many Bealtaine traditions require flowers. Lughnasa was the beginning of the harvest - nothing could be harvested before the proper time by longstanding tradition - and of the harvest fairs, and would have been celebrated when the grain crops were ready to be gathered. Samhain was the beginning of winter, when the herds were brought back in from the summer pastures and extra stock was butchered. It also marked the end of the harvest and gathering anything after Samhain was prohibited as everything left belonged to the daoine sidhe. Many people say that Samhain would have been celebrated after the first hard frost; there is a certain logic to this as frost would ruin any crops left in the fields**. This method of dating is the least rigid and most changeable of the three, and also can prove difficult for people who are far removed from the farming cycle. Each of these approaches has merit, and each has problems. No one is a perfect solution or can be proven beyond question to be the historical method. It is up to individuals to decide which method they prefer and learn how best to apply it within their own practice. **different crops have various tolerances to frost, and this is somewhat dependent on the severity and length of the frost as well, however it seems safe to say that our ancestors would be highly motivated to get all the crops in by the time they started seeing frost and would consider frost a sign of the end of the harvest season and beginning of winter.